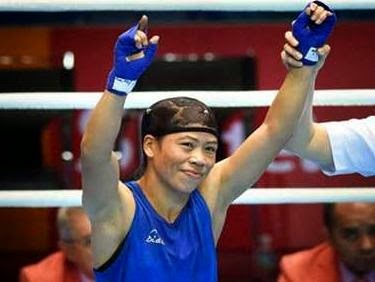 M C Mary Kom on Wednesday became the first Indian woman boxer to clinch a gold medal at the Asian Games after she came from behind to beat Kazakhstan's Zhaina Shekerbekova in the flyweight (51KG) summit clash. The lone Indian boxer in action on Wednesday, Mary Kom defeated Shekerbekova 2-0 in a evenly-contested battle in which the Kazakh had the initial advantage. Mary was at her magnificent best in the final bout of women's flyweight (48-51 kg) division. While Shekerbekova - six years her junior - looked to put up a stiff fight, 31-year-old Mary used a combination of right and left jabs to assert her superiority. Shekerbekova made a good start winning the first round, but Mary used her greater experience to claw back. Mixing her punches, Mary won the next three rounds as the crowd egged her on every minute at the Seonhak Gymnasium in Incheon. The 31-year-old Mary Kom began a bit slowly - studying Shekerbekova's approach before unleashing all her fury against the Kazak. She banked on all her experience from 14 years of boxing and rushed to claim top honours in the event.